The last Championship event before the Main has concluded one day later than planned, and all of the prizes have finally been divvied out. 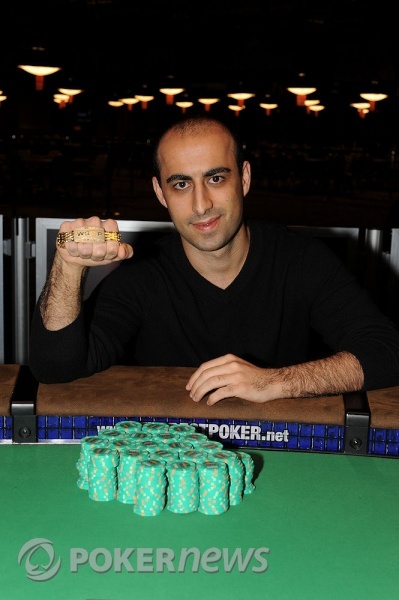 Daniel Alaei has collected the lion's share of those here tonight, taking home the gold bracelet and more than three-quarter million dollars. The final nine players (of the original 346) reconvened this afternoon to spend their Independence Day playing for that shiny piece of jewelry. There was plenty of action from start to finish, but the eliminations were hard to come by as the short stacks hung on to the rungs of the ladder for dear life. 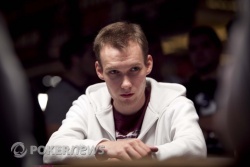 Alexander Kravchenko was ousted in 8th place, and fellow-EPT regular Dmitry Stelmak fell soon after. Ludovic Lacay assembled a hearty cheering section on the rail, but they dispersed quickly upon his fourth-place elimination. In the end, it was Alaei heads up with Miguel Proulx. Whether it was the chip advantage or big the edge in final table experience or the support of his family on the rail -- whatever it was, it propelled Daniel Alaei to a quick and decisive victory to claim the top prize. When the final river card was out, Alaei's arms shot into the air, his wrist ready to accept bracelet number three. 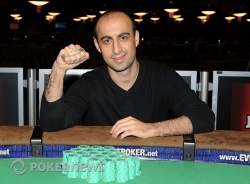 The title of champion for Event #55 has gone to one of the good guys, Daniel Alaei. He's $780,599 richer, and he's now in a much more elite group of triple bracelet winners with plenty of time to rack up a couple more in Series to come. That's all we have for you from the Amazon Room, then. It's big bad Main Event day tomorrow, but for now, all that's left is goodnight. And of course, congratulations once again to Daniel Alaei! Daniel Alaei limped in from the button and Miguel Proulx checked his option in the big blind. The two players left in the event took a flop of and would would've thought it'd be their last. Proulx checked and Alaei bet 250,000. Proulx made the call. The dealer burned and turned the on fourth street, prompting a check from Proulx. Alaei bet the pot for 900,000. Proulx raised all in and Alaei made the quick and cheap call. Alaei tabled the and Proulx the . When Alaei's good friend and railbird Tommy Le saw the hands, he inched closer to the stage and yelled, "He's drawing dead, he's drawing dead!" Well, not quite Tommy. Proulx could still catch a ten and make a higher full house. The river couldn't do it though when the landed and that was it. Alaei's father was rushing down to get to the table when the river card hit and actually tripped and fell. No worries though, he popped right back up with a giant smile on his face and embraced his son in a big hug. For Proulx, he'll have to do with a runner-up finish good for $482,265, coming up just short of capturing two PLO bracelets at the 2010 WSOP. Ville Mattila was all in for 590,000 preflop. Miguel Proulx called. The flop made things awfully interesting as Proulx flopped two pair against Mattila's open-ended straight draw. Mattila paired on the turn to add a couple more outs, and the on the river was Mattila's salvation. He filled in his straight, doubling over 1.3 million. The turn and river came and respectively, and that's another full house and another double up for Mattila. Villa Mattila limped from the button (leaving himself 55,000 behind). Daniel Alaei called, and Miguel Proulx declined his option and saw a free flop. It came out , and Mattila bet his last 55,000. Alaei folded, and Proulx called to put him at risk. Mattila tabled for a pair of tens, and he was out in front of Proulx's . The river was the , and Mattila has more or less tripled up. He's back over 700,000 now. 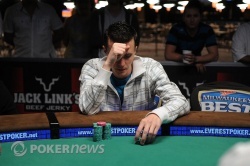 The flop was most decidedly excellent for Proulx as it came down to pull him into a big lead. If the flop was excellent, the turn was something even better excellent; the further improved him to a full house, locking up the pot right there. The meaningless filled out the board. When the chips were counted down, Mattila was left with just 225,000. Proulx is up to 4.29 million.